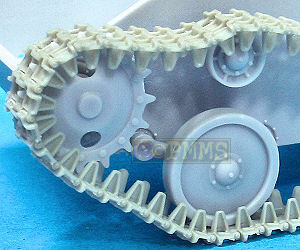 Master Club have released a set of workable resin "snap-together" individual track links for the Miniart T-70M Early w/ Crew (kit #35025), German Pz.Kpfw. T-70 743(r) (kit #35026) and Soviet Light Tank T-70M (Late production) (kit #35030) kits. 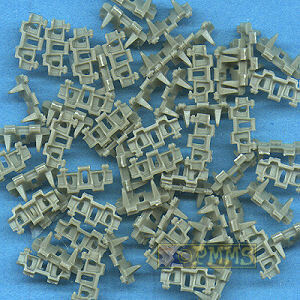 The links are individually cast in light grey resin with just two small casting burs where the links have been pre-broken from the casting blocks to be cleaned up and a few links have some thin resin film to be removed from inside the link holes but the cleanup is very quick and easy, just ensure you don't expose the pin locating holes while removing the excess resin burs. The detail on the links is excellent with clean and well defined track face pattern and the correct shape of the hollowed out inner guide tooth as well as nicely defined track end pins. 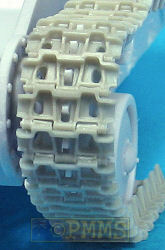 The links are designed to clip together and each link has one large locating pin and one small locating pin that fit into corresponding locating holes on the next track link. To fit the links together slip one link over the larger pin and using a pair of good tweezers "lift" the opposite side with the smaller pin over into the other locating hole. It's best to "lift" the smaller pin in place as just pressing it can easily break off the small pin during the process but the track runs assembled quite easy and are fairly robust. To fit the assembled track runs to the Miniart drive sprockets needs the kit drive teeth to be thinned down to fit into the track guide holes as they are too thick intially but after this the tracks fit nicely around the sprockets. A very nicely detailed workable track set with only minor cleanup and minor alterations needed along with easy assembly to add a nice detail touch to the Miniart T-70 kits.